The present invention relates to fluorine-containing water- and oil-repellent compositions which exhibit good adhesion to the articles to be treated. It is known that fluorine-containing polymers, such as some fluoroalkyl methacrylate polymers, are usable as water- and oil-repellent agents (see, for example, Examined Japanese Patent Publication SHO 47-40467). However, the known polymers having water- and oil-repellent properties have poor compatibility with the article to be treated and further have the problem that the coating of the polymer readily peels when lightly rubbed because of low adhesive strength. In GB-A-1454906 there are described water-and oil-repellent compositions comprising a copolymer of at least two vinyl monomers one of which monomers contains a fluorocarbon chain and the other monomer contains an acid group. In the α-position the monomers have hydrogen or a methyl group. These polymers have low intrinsic viscosity and low adhesive strength. Starting from this state of the art, the main object of the present invention is to provide a fluorine-containing water- and oil-repellent composition for giving uniform tough coatings exhibiting high adhesion to the article to be treated. Other objects and features of the invention will become apparent from the following description. wherein Y is alkylene having 1 to 3 carbon atoms, -CH₂CH₂N(R)SO₂- group (wherein R is alkyl having 1 to 4 cabron atoms) or -CH₂CH(OZ)CH₂- (wherein Z is a hydrogen atom or acetyl), and Rf is fluoroalkyl having 3 to 21 carbon atoms, or fluoroalkyl having 3 to 21 carbon atoms and 1 to 10 oxygen atoms in its carbon chain (wherein no two oxygen atoms are present adjacent to each other). the combined amount of the monomers (i) to (iii) being 100 mole %. We prepared various fluorine-containing acrylate polymers and checked the polymers for adhesion to articles, consequently finding that polymers containing a specific acrylate has outstanding properties for use as a water- and oil-repellent agent. The present invention has been accomplished based on this novel finding. wherein Ph is phenylene, and Rf² is perfluoroalkyl having 5 to 15 carbon atoms. More specific examples of monomers (1) are CH₂=CF-COOCH₂CH₂C₇F₁₅, CH₂=CF-COOCH₂C₂F₅, CH₂=CF-COOCH₂C₈F₁₆CF(CF₃)₂, CH₂=CF-COOCH₂-CF(CF₃)OCF₂-CF(CF₃)OC₃F₇, CH₂=CF-COOCH₂-CF(CF₃)OC₃F₇, CH₂=CF-COOCH₂CH₂-N(CH₃)SO₂C₈F₁₇, CH₂=CF-COOCH₂CH(OH)CH₂C₉F₁₉ and the like. wherein A is a hydrogen atom, chlorine atom or methyl and B is alkyl having 1 to 10 carbon atoms, fluoroalkyl having 1 to 10 carbon atoms, or alicyclic group having 6 to 8 carbon atoms. Also useful are other ethylenically unsaturated monomers including ethylene, propylene, styrene, and acrylates and methacrylates which have a functional group such as vinyl, hydroxyl, carboxyl, glycidyl, dialkylamino or trialkoxysilyl. Examples of acrylates or methacrylates having a functional group are CH₂=C(CH₃)COO(CH₂CH₂O)₁₀COC(CH₃)=CH₂, CH₂=C(CH₃)COO(CH₂)₁₀COC(CH₃)=CH₂, CH₂=C(CH₃)COOCH₂CH-(OCOC(CH₃)=CH₂)CH₂OCOC(CH₃)=CH₂, CH₂=CHCOOCH₂CH₂OH, CH₂=CHCOO-RA (wherein RA is glycidyl), CH₂=C(CH₃)COOCH₂CH₂CH₂Si(OCH₃)₃, etc. More specific examples of monomers (2) are CH₂=CHCOOCH₃, CH₂=CHCOOC₁₂H₂₅, CH₂=CHCOO-RB (wherein RB is cyclohexyl), CH₂=C(CH₃)COOCH₃, CH₂=C(CH₃)COOC₈H₃₇, CH₂=C(CH₃)COOCH₂CH₂C₇F₁₅, CH₂=C(Cl)COOCH₃, etc. The fluorine-containing polymer to be used for Composition A is usually in the range of from 10,000 kmol/kg to 4,000,000 kmol/kg in number average molecular weight (as measured by gel permeation chromatography) and in the range of from 0.25 to 2.0, in intrinsic viscosity [η] (as measured at a temperature of 35°C using m-xylene hexafluoride, methyl ethyl ketone, chloroform, 1,1,1-trichloromethane or like solvent). If the molecular weight is too small, the resulting coating has low strength and is liable to peel off the article treated, whereas if it is too great, the resulting composition is difficult to apply to articles owing to increased viscosity or low free-flowing properties. The fluorine-containing polymer used in Composition A and comprising 10 to 90 mole % of a fluorine-containing acrylate (1) exhibits high adhesion to the article to be treated, forming a tough and flexible coating. The monomers represented by the formula (2) and inexpensive monomers, such as ethylene, propylene and styrene, are useful for reducing the cost of the fluorine-containing polymer and act to impart hardness to the fluorine-containing polymer. The monomers of the formula (2) and other monomers, such as ethylene, propylene and styrene, are used usually in an amount of up to 90 mole %. The fluorine-containing polymer, when containing a functional group, exhibits improved adhesion to the article to be treated. Further the functional group can be utilized for crosslinking the fluorine-containing polymer. For the crosslinking, methods which are usually used in the art can be resorted to (see, for example, JP-A-7242880). Usually up to 30 mole % of acrylate or methacrylate is used which has the functional group to be introduced into the fluorine-containing polymer. Composition B comprising a fluorine-containing polymer which comprises 10 to 90 mole % of monomer represented by the formula (3), 10 to 80 mole % of monomer represented by the formula (4) and 0 to 50 mole % of other copolymerizable ethylenically unsaturated monomer also exhibits excellent water- and oil-repellent propoerties. Examples of groups R¹ in the formula (3), which are not limited specifically, are alkyl groups such as methyl, ethyl, butyl and stearyl; halogenated (but not fluorinated) alkyl groups such as 2-chloroethyl; cycloalkyl groups such as cyclohexyl, bornyl and adamantyl; aromatic groups such as phenyl and naphthyl; silicon-containing groups such as trimethylsilyl and trimethylsilylpropyl; phosphorus-containing groups such as dimethylphosphateethyl; groups having an unsaturated bond such as allyl; groups having a functional group, such as cyanoethyl and glycidyl; groups having dialkylamino such as dimethylaminoethyl; groups having an ether group such as tetrahydrofurfuryl; etc. wherein Ph is phenylene, and Rf⁵ is perfluoroalkyl having 5 to 15 carbon atoms. More specific examples of monomer (4) include CH₂=CHCOOCH₂CH₂C₇F₁₅, CH₂=CHCOOCH₂C₂F₅, CH₂=C(CH₃)COOCH₂C₈F₁₆CF(CF₃)₂, CH₂=CHCOOCH₂CF(CF₃)OCF₂CF(CF₃)OC₃F₇, CH₂=C(CH₃)COOCH₂CF(CF₃)OC₃F₇, CH₂=CHCOOCH₂-CH₂N(CH₃)CO₂C₈F₁₇, CH₂=C(CH₃)COOCH₂CH(OH)CH₂C₉F₁₉, CH₂=CHCOOCH₂CH₂C₈F₁₉, CH₂=CHCOOCH₂CF(CF₃)OC₃F₇, CH₂=C(CH₃)COOCH₂CH₂C₇F₁₅ and the like. The fluorine-containing polymer to be used for Composition B is usually in the range of from 10,000 kmol/kg to 4,000,000 kmol/kg in number average molecular weight (as measured by gel permeation chromatography) and in the range of from 0.25 to 3.0, preferably from 0.5 to 2.0, in intrinsic viscosity [η] (as measured at a temperature of 35°C using m-xylene hexafluoride, methyl ethyl ketone, chloroform, 1,1,1-trichloromethane or like solvent). If the molecular weight is too small, the resulting coating has low strength and is liable to peel off the article treated, whereas if it is too great, the resulting composition is difficult to apply to articles owing to increased viscosity or low free-flowing properties. The fluorine-containing polymer used in Composition B and comprising 10 to 90 mole % of an fluorine-containing acrylate (3), exhibits high adhesion to the article to be treated, forming a tough and flexible coating. Composition B comprising a fluorine-containing copolymer containing 10 to 80 mole % of an acrylate (4) gives a coating excellent in water- and oil-repellent properties. Other copolymerizable ethylenically unsaturated monomer, when incorporated into composotion B, acts to impart improved hardness to the coating of composition. The fluorine-containing polymers of the present invention can be prepared by radical polymerization (e.g. solution, bulk or emulsion polymerization) or anionic polymerization. Examples of solvents useful for solution polymerization are fluorine-containing solvents such as m-xylene hexafluoride and trichlorotrifluoroethane, hydrocarbon solvents such as ethyl acetate, methyl isobutyl ketone, acetone, toluene and xylene, etc. The polymer obtained by solution polymerization can be used in the form of a solution which is prepared by separating the polymer from the solvent and dissolving the polymer in a solvent after drying, or in the form of a solution which is prepared by merely diluting the resulting reaction mixture. The polymer obtained by bulk polymerization is usable as dissolved in a solvent after drying. Examples of polymerization initiators useful for solution polymerization and bulk polymerization are azo compounds such as azobisisobutyronitrile, peroxide compounds such as benzoyl peroxide and the like. For solution polymerization and block polymerization, mercaptans such as laurylmercaptan and thiphenol are usable as chain transfer agents. In either of these two processes, the polymerization temperature is preferably 30 to 100°C. Before application to the article to be treated, the fluorine-containing polymer prepared by solution or bulk polymerization is dissolved in a dissolving solvent capable of thoroughly dissolving the polymer and further diluting the solution with a diluting solvent capble of dissolving the polymer without permitting the dissolved polymer to separate out. Like usual water- and oil-repellent agents, the resulting composition is applied to the article by dipping, brushing, spraying or otherwise. Preferably the concentration of the composition is 0.1 to 30 wt.% for brush coating or about 0.05 to about 2 wt.% for spray coating. The coating is dried at room temperature to 150°C. Examples of useful dissolving solvents are fluorine-containing solvents such as m-xylene hexafluoride and trichlorotrifluoroethane, chlorine-containing solvents such as trichloroethane, etc. Examples of useful diluting solvents are chlorine-containing solvents such as tetrachloroethylene and trichloroethylene, ketone solvents such as acetone, ester solvents such as ethyl acetate, aromatic solvents such as toluene, etc. The dissolving solvent is usable also as the diluting solvent. Nonionic compounds are desirable as emulsifiers for emulsion polymerization, while cationic emulsifiers are also usable. The polymerization initiator to be used for emulsion polymerization is preferably a water-soluble compound. Examples of such compounds are azo compounds such as azobisisobutyroamidine hydrochloride, peroxide compounds such as succinic acid peroxide, etc. The emulsion polymerization temperature is preferably 30 to 100°C. The fluorine-containing polymer prepared by emulsiton polymerization is usable as an aqueous composition. Usually, the emulsifier need not be removed from the reaction mixture. The aqueous water- and oil-repellent composition is usable in the same manner as above. Since the aqueous composition contains water, it is desirable to heat the coating thereof at 100 to 150°C for drying. When the fluorine-containing acrylate of the formula (1) is to be singly polymerized, it is preferable to resort to anionic polymerization in view of the velocity of polymerization. Examples of polymerization initiators usable for anionic polymerization are alkali metals, metallic hydrides, sodium amide, Grignard reagents, metal alkyl, pyridine and the like. Examples of solvents usable for anionic polymerization are aromatic solvents such as toluene, ether solvents such as tetrahydrofuran, etc. Anionic polymerization is conducted usually in a high vacuum of about 6.9 · 10⁻⁶ kPa (1 x 10⁻6 mm Hg) or in a dry inert gas atmosphere. The polymerization temperature is usually -100 to 70°C. The polymer prepared by anionic polymerization can be applied to the article to be treated in the same manner as the one prepared by solution polymerization. The water- and oil-repellent composition of the present invention is usable for giving water- and oil-repellent properties to various solid articles which must be resistant to abrasion, such as tents, sheet covers, umbrellas, raincoats, shoes, caps to hats, bags, jackets, jumpers, aprons, blazers, slacks, skirts, other garments, carpets, sofas, curtains, etc. Further, the composition of the invention is useful as an agent for preventing the adhesion of liquid polymers such as epoxy resin. The water- and oil-repellent composition of the invention comprises a polymer which contains as a component thereof a specific fluorine-containing acrylate having a fluorine atom or fluorine-containing group at the α-position. The present composition is superior to conventional water- and oil-repellent compositions in adhesion to the article to be treated and has high durability against laundry. Into a 200-c.c. glass ampule were placed 50 g of a monomer represented by the formula: CH₂=CF-COOCH₂-CF(CF₃)OC₃F₇ (hereinafter referred to as "αF6FO"), 4 g of glycidyl methacrylate (hereinafter referred to as "GMA"), 80 g of m-xylene hexafluoride (hereinafter referred to as "m-XHF") and 0.5 g of azobisisobutyronitrile, and the mixture was deaerated and purged with nitrogen repeatedly three times by the freeze-thaw method using methanol/dry ice. The ampule was then sealed off. The ampule was immersed in a constant-temperature bath at 50°C for 30 hours. The reaction mixture was thereafter placed into petroleum ether, and the resulting precipitate of fluorine-containing polymer was dried, giving 52 g of a fluorine-containing polymer. The polymer had an intrinsic viscosity [η] of 1.12 as measured at a temperature of 35°C using m-XHF as a solvent. Elementary analysis of the polymer revealed 30.2% of carbon and 54.4% of fluorine, indicating that the monomers had been polymerized almost entirely. The polymer was dissolved in m-XHF (dissolving solvent) to a concentration of 30 wt.%, and the solution was diluted with trichlorotrifluoroethane (diluting solvent) to a concentration of 0.5 wt.%. The dilution was applied to a synthetic leather comprising a polyurethane-coated nonwoven fabric, 3 mm in thickness, with a brush and then heated at 80°C for 30 minutes to prepare a specimen for testing adhesion. 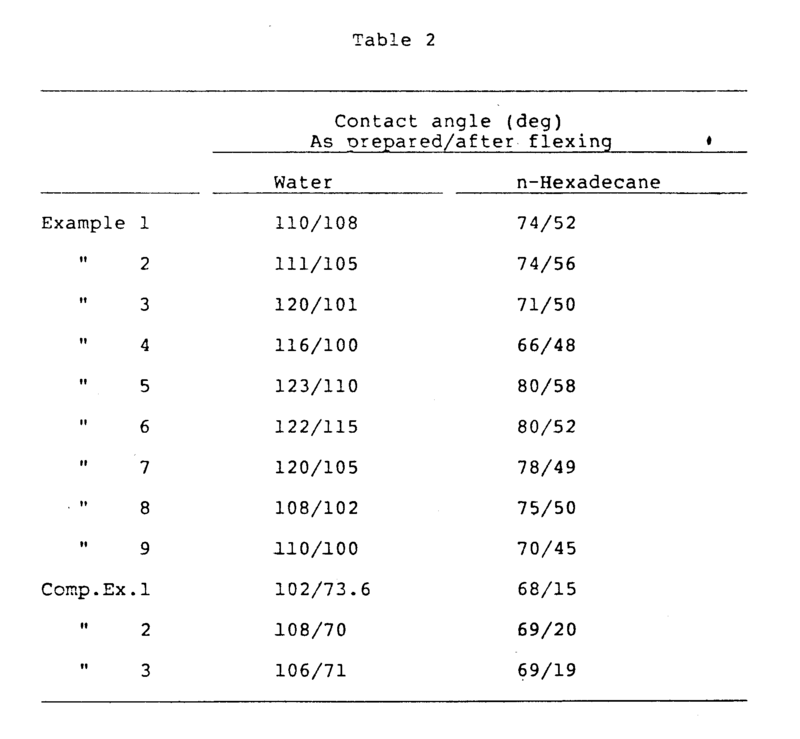 The contact angle of water, as well as n-hexadecane, with respect to the specimen was measured immediately after the preparation and after flexing the specimen through 120 degrees 10,000 times. Table 2 shows the results. In Table 1 and in the following, the monomer representing symbols represent the following. Water (1.9 liters), 400 g of acetone, 300 g of α F6FO, 19 g of MA, 1 g of EGMA and 40 g of an emulsifier (K220, product of Nippon Oils & Fats Co., Ltd.) were placed into a 3-liter four-necked flask equipped with a stirrer, thermometer, reflux condenser and dropping funnel and oxygen was removed from the system by introducing nitrogen thereinto. The flask was placed into a constant-temperature bath at 65°C. After the mixture was heated to a constant temperature, 0.1 liter of water having dissolved therein 1.6 g of azobisisobutyronitrile hydrochloride was added dropwise to the mixture to start polymerization. Four hours later, a dispersion was obtained which contained 12 wt.% of solids. A portion of the dispersion was sampled and checked for monomer composition ratio and intrinsic viscosity [η]. The αF6FO/MA/EGMA ratio was 97.3/6/0.3 by weight (elementary analysis: 39.6% carbon and 55.0% fluorine) and the viscosity [η] was 0.68. The dispersion was diluted with water to a concentration of 0.5 wt.% in a padding container. A polyester fabric was dipped in the padding bath, squeezed to remove the dilution, then dried at 80°C for 3 minutes and heat-treated at 150°C for 3 minutes to obtain a test specimen. The specimen was tested for water repellency according to JIS L 1092 and for oil-repellency according to AATCC 118-1966T. The results were 100⁺ and No.6, respectively. The same specimen as above was washed under the conditions of bath ratio of 1:50 and temperature of 40°C using a household electric washing machine and a detergent ("Super-Sabu", product of Kao Co., Ltd., Japan), then dried in air, lightly ironed at 140°C and subjected to the two tests againing, giving the results of 100⁺ and No.5, respectively. Polymerization was conducted and a test specimen was prepared under the same conditions as in Example 10 with the exception of using 300 g of 17FA, 19 g of MMA and 1 g of EGMA as monomers. The polymer obtained was 0.38 in intrinsic viscosity [η]. Under the same conditions as in Example 10, the specimen was tested for water repellency and for oil repellency before and after laundry. The water repellency reduced from 100⁺ to 70, and the oil repellency from No.3 to No.0. In Table 3, the monomer representing symbols mean the following monomers. wherein Y is alkylene having 1 to 3 carbon atoms, -CH₂CH₂N(R)SO₂- group wherein R is alkyl having 1 to 4 cabron atoms or -CH₂CH(OZ)CH₂- wherein Z is a hydrogen atom or acetyl, and Rf is fluoroalkyl having 3 to 21 carbon atoms, or fluoroalkyl having 3 to 21 carbon atoms and 1 to 10 oxygen atoms in its carbon chain wherein no two oxygen atoms are present adjacent to each other. (ii)90 to 10 mole % of an ethylenically unsaturated monomer. wherein A is a hydrogen atom, chlorine atom or methyl and B is alkyl having 1 to 20 carbon atoms, alicyclic group having 6 to 8 carbon atoms or fluoroalkyl having 1 to 10 carbon atoms; ethylene, propylene, styrene; and (metha)acrylate having vinyl, hydroxyl, carboxyl, glycidyl, dialkylamino or trialkoxysilyl. A composition as defined in claim 1 which is in the form of a solution. A composition as defined in claim 1 which is in the form of an aqueous dispersion. A composition as defined in claim 7 which is in the form of a solution. A composition as defined in claim 7 which is in the form of an aqueous dispersion.